Last Friday I had a chance to visit Barbeque Pride with my roommate and sister. I booked a table for three from zomato. Our booking was for 9:30 P.M. We barely reached at time. The restaurant is on the 3rd floor. After getting off the lift we could see some boys and girls gathering at the entrance. We showed up our booking confirmation message and got the table in 5 minutes. I don’t know how much it is crowded on a regular day but I would recommend you to have your reservation beforehand to be on the safe side. The ambiance is quite nice and there is a lot of space around the sitting arrangements. This place serves mainly buffet. So here was the menu for the day we visited Barbeque Pride. Andhra spicy prawns : We did eat one prawn dish in starter which was good. It was not spicy though! So I can’t tell if it was Andhra “Spicy” Prawns at all. 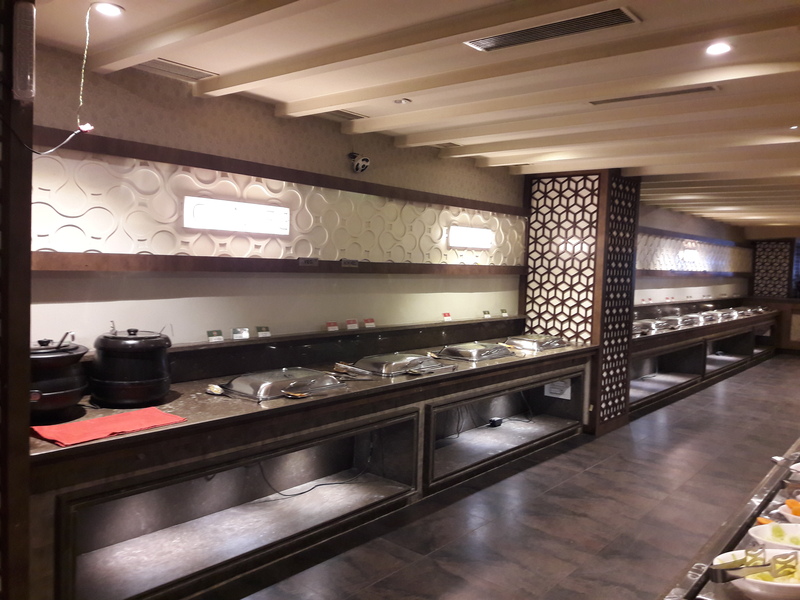 Parslay Fish, Amritsari Fish : Comparing with other similar restaurants, I found the fish starters better. Karachi Botti : This was simply good. Guntur Chicken : Among the chicken starters, this was the best. I have had so many chicken dishes in my life but this got me in whole different level. It was a perfect blend of spices, almost tasted like some pickle. Mutton Galouti Kebab : I tried galouti kebab for the first time and I have never tasted something so good in my life. The mutton was so tender and mildly spiced that it melted in the mouth. I don’t understand why the veg starters are always ignored. Like there should be equally tasty starters for vegetarian fellows! Vietnamese mushroom : This wasn’t available. Tandoori bagicha : They didn’t serve it. BBQ Pineapple : This is grilled pineapple. This normally tastes good. I assume the pineapple they particularly used wasn’t of the best quality. Long stick pineapple : They didn’t serve it. Jamaican potato : This one stole the show. We loved it so much that we asked to repeat this one. They also served grilled watermelon, which tasted nothing different from the regular ones. It wasn’t on the menu. They served Veg Hot and Sour soup and Chicken brown Garlic soup. In this section they had Chicken Yellow Thai Curry(Isn’t that Thai rather than Chinese?! ), Chicken fried rice and chicken schezwan noodles. It tasted just fine. In this section they had Veg Thai rice, Veg Hakka Noodles and Veg Manchurian Curry. I couldn’t manage to taste them but here’s a photo of how it looked like. In Italian non-veg, they offered chicken lasagna and chicken pasta. I didn’t find the lasagna cheesy enough. Taste wise it was fine. The pasta was okayish. Here we had veg risotto and veg pasta. The risotto was fine. Surprising the veg pasta was better than the chicken one. By this time, we were almost full. We were yet to taste half of the dishes. For the Indian main course we could just taste the dishes to spare a little space for the desserts! Chicken Dum Biriyani : This is Hyderabadi special biriyani, the smell is everything! Mutton keema Biriyani : In a buffet, this was an uncommon thing to see. It had minced mutton pieces and tasted better than the previous one. Fish pulusu : South Indian style fish curry. A bunch of Bengalis can never be impressed with that. So I’m not commenting on the taste. The menu is little longer for the veg section but I felt like most of them are like regualr food that people have on regular basis. Dosa lovers, pay attention! This place has live dosa counter as well. paneer(cheese), broccoli, Corn, mushroom, baby corn. Suprisngly they had live pizza counter that baked mini pizza with your choice of topping! Mix fruit cheese cake – Good. Angoori gulab jamun – Nothing can beat the taste of hot gulab jamun. Stone ice cream – Customization was available for this. Ours was good. Also there was pani puri in chat section. What else you can ask more for? Apart from that we ordered soft drinks to wash it down. Obviously it is not possible to eat this insane amount of food every now and then! Do I want to come back here for more?